Charge or sync your Micro-B USB devices with the cable out of the way. 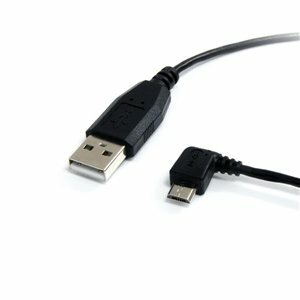 The UUSBHAUB6LA 6-foot USB-A to Micro-B Cable provides a high quality connection between Micro USB-equipped USB 2.0 mobile devices (such as BlackBerry or Android-based smart phones, digital cameras, Tablet PC devices and GPS systems, etc.) and a USB-capable computer, for everyday tasks such as data synchronization, file transfers and charging.The left-angled Micro USB connector positions the cable in such a way that it allows you to easily access your mobile digital device in both portrait and landscape mode, even while charging.As an alternative, StarTech.com also offers a 6ft USB A to Right Angle Micro B Cable (UUSBHAUB6RA), which provides the same convenience as this left-angled cable but allows you to connect to your USB Micro-B devices from the opposite direction.